Looking to actually use your iPhone as intended? Then you’ll need data, and l0ts of it, especially if you want to abandon the mobile data sticks and tether your phone to your computer when travelling. I’ve run the numbers from all three major suppliers, and assumed that you’d buy the best deal, and that you correctly project your demand when you do so. The charts below ignore the various values of text and voice in the plans, and show the cheapest way to obtain data under each of the three carriers. For data consumption under 3GB – Telecom is the winner, with Vodafone close at 500MB and then beating out only 2Degrees for 2GB or less. But what if you use more than 3GB a month, as I often do? Telecom is cheapest again (using their 2GB+4GB add-on plan), 2Degrees is next (using their nationwide plan which costs $100 per extra 1G), while Vodafone is most expensive (using the 500MB plan + 1 GB addon plan.) Vodafone suffers badly as above 1.5GB it has a punitive rate of $200 per 1GB. That’s 15 and 20GB on the right hand side, so don’t panic, and equally don’t expect to use your mobile phone as a replacement for your home data. (My home plan is 150GB a month). But if you are a heavy data user then right now Telecom is the place to be, up until 10GB, which is when their punitive rate (10c/mb) kicks in. Above 10GB you’d be smarter to sign up to another plan and wield two phones or sim cards. So while Telecom is cheapest now, whatever you do don’t sign up to a contract. Your use will change a lot over the next 2 years, and so will the prices in the market. The rebate you get on a phone is small compared to month after month of restricted service or very high data charges versus competition. A few hundred dollars now might cost you a couple of hundred dollars a month down the track. So go ahead and get an iPhone, but sign up to a month by month deal, monitor your usage and adjust the plan and supplier regularly. I welcome any fact checking by the way. 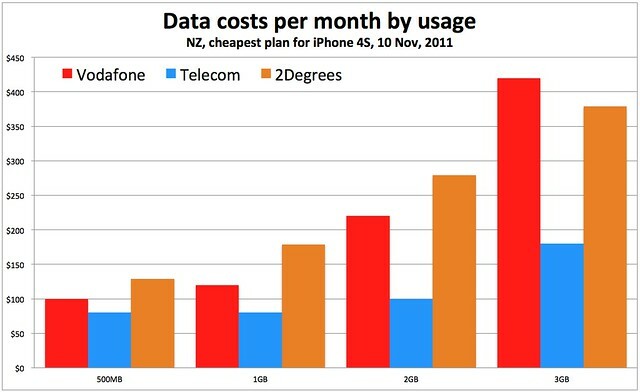 I used the published iPhone 4S plans for Vodafone and Telecom, and the 2degrees on account plans. So I have a 4S that I purchased in Aus last month, signed up to Telecom and pay $40 per month for 500mbs … thats pretty good. I know I can change my plane to $60 per month and get 1GB of data … Im not sure you chart reflects my plan ? 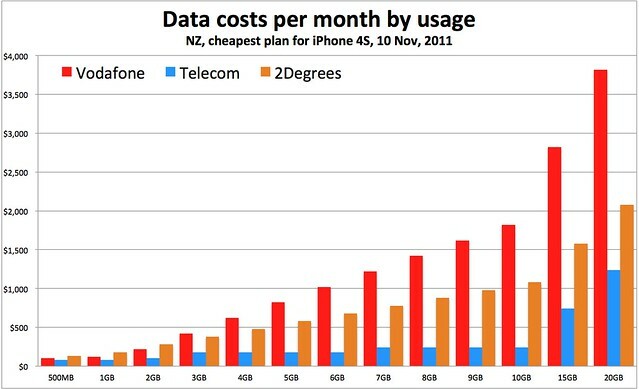 One thing that has not been taken into account is nationwide vs. local data usage in respect to 2degrees. I spend 95% of my time in the big centres and therefore can get 12 GB of data for $150 in these areas. This is a lot cheaper than Telecom and Vodafone but will obviously only work for people in these areas. Hopefully as the 2degrees network grows, so will competition in rest of the country. You make a valid point. Perhaps more interesting than 2degrees, which is quite new and small, is the difference in costs between Telecom and Vodafone plans. This puts 2degrees by far cheaper than any other provider, which should be taken into account. And the size of 2degrees’s mobile broadband zones continues to grow. It now extends from Wellington as far north as Otaki. I hear they’re in Hamilton now too. Perhaps Taranga too. Evan beat me to the punch, but yes on 2degrees you can buy extra data as you need by simply sending a single text message. But as Evan pointed out, this only works in the 2degrees canopy areas which cover most of the main centres in NZ and are growing rapidly. $20 will buy you an extra 1GB, or $50 for 3GB, or $150 for 12GB. One of the advantages to this is that you don’t need to pay for data that you’re not using. So if you know that you’re going to be doing a lot of tethering, you can buy extra data just by sending a text message. Can you do this comparison for prepaid plans? I had looked at thought 2Degrees was by far the best for 3GB on prepaid? 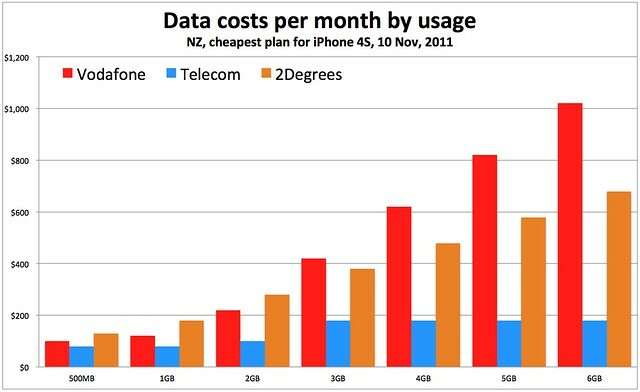 I got moved into Vodafone’s “3GB per month regardless of what you’re paying” plan after buying the iPhone 4 last year. Apparantly, they intend to keep it that way for the lifetime of my plan. Coupled with 2500 TXTs, 1000 PXTS and 30 (meh) minutes of calling for $40 a month for the 32GB iPhone 4? After looking at the telecom plans even if you do sign up for a contract and then decide to terminate you really don’t lose out.